Set right on the edge of a stunning sandy beach, Clos du Rhône provides guests with the perfect place to have fun in the sun. Arranging to stay at this impressive site is as easy as a few mouse clicks thanks to LuxCamp. 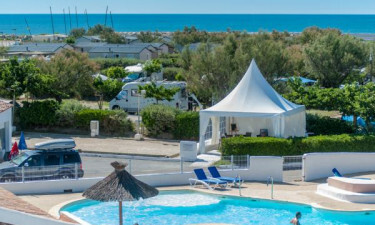 Why choose Camping Clos du Rhône? 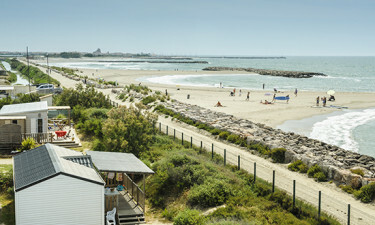 Guests will find a beauty sandy beach right on the edge of Clos du Rhône and this is a popular place to spend time during any camping holiday. The beach is set in a sheltered cove and the waves are gentle enough for even young children to splash around in. Clos du Rhône boasts a large outdoor water park that comes complete with looping water slides and several pools. While this is a great place for kids to play, luxury camping lovers who simply want to unwind can also sit and soak in the Jacuzzi. Set in the heart of the Camargue region, the pretty village of Saintes Maries de la Mer is just a short stroll from the site. 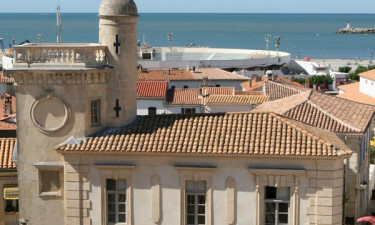 People who are interested in history and culture will also want to check out Avignon Castle.